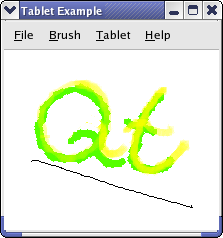 When you use a tablet with Qt applications, QTabletEvents are genarated. You need to reimplement the tabletEvent() event handler if you want to handle tablet events. Events are generated when the device used for drawing enters and leaves the proximity of the tablet (i.e., when it is close but not pressed down on it), when a device is pushed down and released from it, and when a device is moved on the tablet. The information available in QTabletEvent depends on the device used. The tablet in this example has two different devices for drawing: a stylus and an airbrush. For both devices the event contains the position of the device, pressure on the tablet, vertical tilt, and horizontal tilt (i.e, the angle between the device and the perpendicular of the tablet). The airbrush has a finger wheel; the position of this is also available in the tablet event. In this example we implement a drawing program. You can use the stylus to draw on the tablet as you use a pencil on paper. When you draw with the airbrush you get a spray of paint; the finger wheel is used to change the density of the spray. The pressure and tilt can change the alpha and saturation values of the QColor and the width of the QPen used for drawing. The MainWindow class inherits QMainWindow and creates the examples menus and connect their slots and signals. The TabletCanvas class inherits QWidget and receives tablet events. It uses the events to paint on a QImage, which it draws onto itself. The TabletApplication class inherits QApplication. This class handles tablet events that are not sent to tabletEvent(). We will look at this later. The QActions let the user select if the tablets pressure and tilt should change the pen width, color alpha component and color saturation. createActions() creates all actions, and createMenus() sets up the menus with the actions. We have one QActionGroup for the actions that alter the alpha channel, color saturation and line width respectively. The action groups are connected to the alphaActionTriggered(), colorSaturationActiontriggered(), and lineWidthActionTriggered() slots, which calls functions in myCanvas. In the constructor we create the canvas, actions, and menus. We set the canvas as the center widget. We also initialize the canvas to match the state of our menus and start drawing with a red color. We let the user pick a color with a QColorDialog. If it is valid, we set a new drawing color with setColor(). The TabletCanvas class supports two ways by which the alpha channel of the drawing color can be changed: tablet pressure and tilt. We have one action for each and an action if the alpha channel should not be changed. We check which action is selected in lineWidthGroup, and set how the canvas should change the drawing line width. We check which action is selected in colorSaturationGroup, and set how the canvas should change the color saturation of the drawing color. We use the QFileDialog to let the user select a file to save the drawing in. It is the TabletCanvas that save the drawing, so we call its saveImage() function. createActions() creates all actions and action groups of the example. We look at the creation of one action group and its actions. See the application example if you want a high-level introduction to QActions. We want the user to be able to choose if the drawing color's alpha component should be changed by the tablet pressure or tilt. We have one action for each choice and an action if the alpha channel is not to be changed, i.e, the color is opaque. We make the actions checkable; the alphaChannelGroup will then ensure that only one of the actions are checked at any time. The triggered() signal is emitted when an action is checked. We create the menus of the example and add the actions to them. The canvas can change the alpha channel, color saturation, and line width of the drawing. We have one enum for each of these; their values decide if it is the tablet pressure or tilt that will alter them. We keep a private variable for each, the alphaChannelType, colorSturationType, and penWidthType, which we provide access functions for. We draw on a QImage with myPen and myBrush using myColor. The saveImage() and loadImage() saves and loads the QImage to disk. The image is drawn on the widget in paintEvent(). The pointerType and deviceType keeps the type of pointer, which is either a pen or an eraser, and device currently used on the tablet, which is either a stylus or an airbrush. The interpretation of events from the tablet is done in tabletEvent(); paintImage(), updateBrush(), and brushPattern() are helper functions used by tabletEvent(). In the constructor we initialize our class variables. We need to draw the background of our image, as the default is gray. QImage implements functionality to save itself to disk, so we simply call save(). We simply call load(), which loads the image in file. We get three kind of events to this function: TabletPress, TabletRelease, and TabletMove, which is generated when a device is pressed down on, leaves, or moves on the tablet. We set the deviceDown to true when a device is pressed down on the tablet; we then know when we should draw when we receive move events. We have implemented the updateBrush() and paintImage() helper functions to update myBrush and myPen after the state of alphaChannelType, colorSaturationType, and lineWidthType. We simply draw the image to the top left of the widget. In this function we draw on the image based on the movement of the device. If the device used on the tablet is a stylus we want to draw a line between the positions of the stylus recorded in polyLine. If it is an airbrush we want to draw a circle of points with a point density based on the tangential pressure, which is the position of the finger wheel on the airbrush. We use the Qt::BrushStyle to draw the points as it has styles that draw points with different density; we select the style based on the tangential pressure in brushPattern(). We return a brush style with a point density that increases with the tangential pressure. The alpha channel of QColor is given as a number between 0 and 255 where 0 is transparent and 255 is opaque. pressure() returns the pressure as a qreal between 0.0 and 1.0. By subtracting 127 from the tilt values and taking the absolute value we get the smallest alpha values (i.e., the color is most transparent) when the pen is perpendicular to the tablet. We select the largest of the vertical and horizontal tilt value. The colorsaturation is given as a number between 0 and 255. It is set with setHsv(). We can set the tilt values directly, but must multiply the pressure to a number between 0 and 255. The width of the pen increases with the pressure. When the pen width is controlled with the tilt we let the width increse with the angle between the device and the perpendicular of the tablet. We finally check wether the pointer is the stylus or the eraser. If it is the eraser, we set the color to the background color of the image an let the pressure decide the pen width, else we set the colors we have set up previously in the function. We keep a TabletCanvas we send the device type of the events we handle in the event() function to. The TabletEnterProximity and TabletLeaveProximity events are not sendt to the QApplication object, while other tablet events are sendt to the QWidget's event(), which sends them on to tabletEvent(). Since we want to handle these events we have implemented TabletApplication. We use this function to handle the TabletEnterProximity and TabletLeaveProximity events, which is generated when a device enters and leaves the proximity of the tablet. The intended use of these events is to do work that is dependent on what kind of device is used on the tablet. This way, you don't have to do this work when other events are generated, which is more frequently than the leave and enter proximity events. We call setTabletDevice() in TabletCanvas. In the main() function we create a MainWinow and display it as a top level window. We use the TabletApplication class. We need to set the canvas after the application is created. We cannot use classes that implement event handling before an QApplication object is instantiated.